- Have you ever wondered why investments always seem to go down after you buy them? - Are you overwhelmed by the number and complexity of investment choices? - Do you have a plan to create lifetime income from your investments, while preserving your principal? 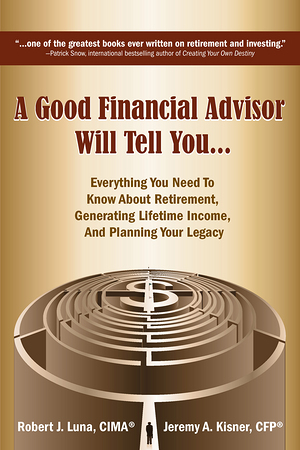 - Are you unsure how to find a good financial advisor and what to expect from one? In A Good Financial Advisor Will Tell You, authors Jeremy Kisner, CFP and Robert Luna, CIMA answer these common concerns and reveal what people really need to know to make better financial and investment decisions. Rather than write another boring book that explains stocks and mutual funds, the authors explore behavioral finance-the reasons why people make investing mistakes-and they teach readers how to avoid doing the same. Countless people amass small fortunes during their lifetimes only to squander them through inadequate planning and poor investments. We are all familiar with the celebrities who have lost it all. What is not reported in the press is how many middle class millionaires also lose it all. And an even larger number of people do not lose it all but could have left a legacy for generations if they had made better financial decisions. Most investors do not fare well precisely because they are human. Human beings are hard-wired to make decisions with their hearts or intuitions and then justify those decisions with logic. Greed and fear rule the day, but a better way exists that will allow investors to avoid mistakes and enjoy greater wealth and retirement income. After reading this book you will be a more educated investor and a better consumer of financial services.